Word on the street is that Miss Crabtree likes to crack out her chicken and rice speciality dish to all her guests, providing them with a delicious chicken in white wine sauce. Great...but why is this being mentioned on the world’s number one pie blog? Well let me tell you! For it was an absolute delight when recently frequenting said friend’s house for said chicken and rice speciality dish that the chicken dish had been covered in pastry and turned into a pie! * Excellent! 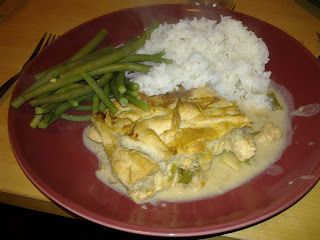 So after a delightful starter provided by Caitlin, the pie main course was served! And while it took a little getting used to seeing a side serving of rice and green beans (rather than the traditional mash/chips and peas), let’s be honest – all you want to know about is how good the pie tasted! The colour of the pastry was lovely and golden, and there was no doubt that there was plenty of chicken packed into the pie slice I was given. The chicken was succulent and not at all chewy, while the sauce was delicious, creamy and complimented the chicken perfectly (it was clear this was a speciality meal!) The major disappointment was that the pie was, unfortunately, just a top crust. It did therefore lack the ideal ratio of pastry to content. But for a top crust, it was a very nice homemade pie. Full compliments to the chef! Start saving for your Olympic Pies!